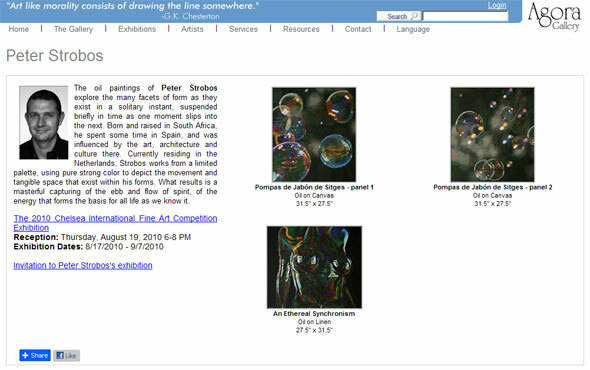 Peter Strobos was selected as an award winning artist in the 25th Annual Chelsea International Fine Art Competition by Ms. Megan Fontanella, Assistant Curator of the Solomon R. Guggenheim Museum in New York. 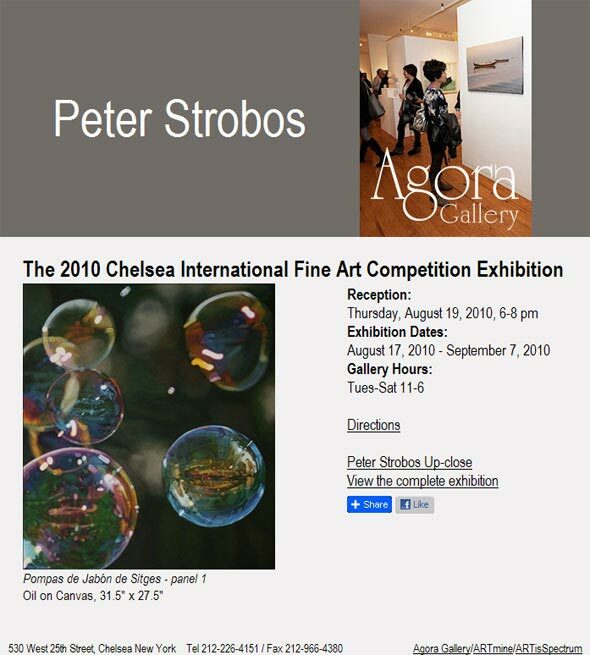 He was presented an Award Certificate of Excellence by Ms. Fontanella and selected to participate in a Collective Exhibition at Agora Gallery, Chelsea – Manhattan, New York during August of 2010. On the reception evening Peter and other international award recipient artists were introduced to all present by Gallery Director, Angela Di Bello, and applauded for having being chosen from literally hundreds upon hundreds of international entrants, as well as for the high standard of work displayed. Two questions where put forward and the artists were later interviewed in the video room. Here’s the video from the wonderful opening reception of the Chelsea International Fine Art Competition exhibition at Agora Gallery, Chelsea-Manhattan, New York City. Enjoy!